In recent years, medical tourism has been on the rise across Europe. Indeed, according to PwC, it is growing at around 12 to 15 percent per annum in Central and Eastern Europe alone. While countries such as Spain, the Czech Republic and Poland are making names for themselves for a variety of treatments, Hungary has become the continent’s dentistry capital, attracting visitors from far and wide. Hungary’s charm as a tourist destination further adds to this appeal. Of particular note is its thermal spas: there are more than 1,000 natural hot springs running below the surface of Hungary, with the country boasting a greater number of medicinal spas than any other in Europe. These waters have long been hailed for their health benefits, earning Budapest its nickname as the ‘city of spas’. European CEO spoke to Soma Veszprémi, Head Dentist at Budapest-based clinic Evergreen Dental, to find out more about Hungary’s burgeoning dental tourism industry. Why is Budapest becoming such a magnet for dental tourism? Travelling for health purposes has become very trendy of late, with more people realising they can combine the practical with the pleasant. Hungary, in particular, has benefitted from this change in attitude, becoming the preferred destination for 41 percent of Western European dental patients seeking treatment abroad, according to our estimates. This is no doubt a result of the country’s ability to provide top-quality dentistry at much lower prices than elsewhere. Budapest has also become a tourism hotspot over the past few years, with its magnificent architecture – including the stunning Hungarian Parliament Building, Buda Castle, the Great Market Hall and Gellért Baths – attracting travellers from around the world. Those looking for culture, history and art, meanwhile, are drawn to the city’s wide offering of museums. Budapest has long been renowned for its thermal baths, but more recently it has become just as famous for its gastronomy and nightlife. What’s more, as a safe, friendly and very affordable location that is easy to reach, Budapest offers a dentistry experience that is second to none, ensuring travellers leave with a beautiful smile and huge savings. What has been the key to Evergreen Dental’s rapid growth? 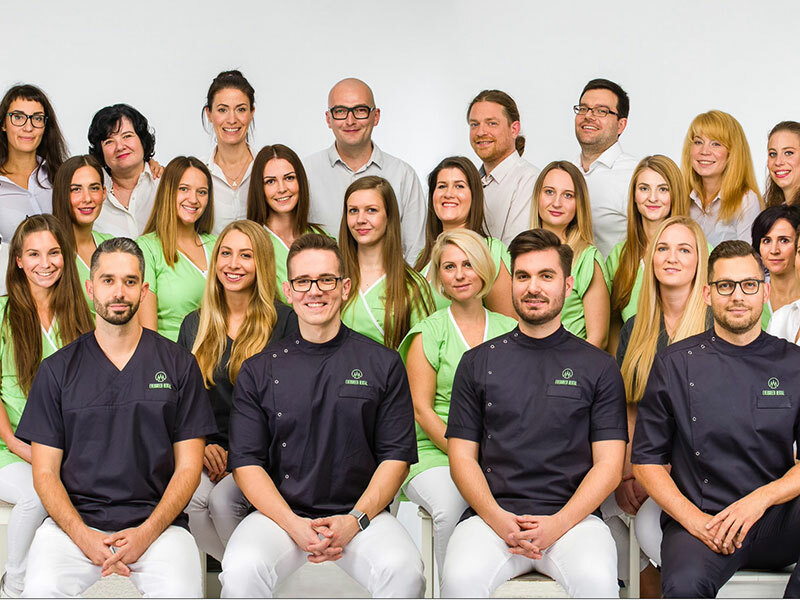 According to Global Clinic Rating – the TripAdvisor of medical institutes – Evergreen Dental is now the second-best-rated clinic in Budapest, ranking first in the customer service category. We earned this reputation by being quick to respond to clients’ needs, remaining transparent and ensuring our patients are always completely comfortable. Evergreen is also very flexible and boasts one of the friendliest, most professional dentistry teams in Budapest. All of these factors lead to a patient experience that exceeds expectations and ensures the clinic is recommended time and again. How is Evergreen Dental different to other dental clinics? Located within a magnificent, fully renovated 19th-century house on the famous Andrássy Avenue, Evergreen Dental distinguishes itself from the competition with a combination of comfort and service. Each treatment room is large and boasts interior furnishings that are awash with warm, soothing colours. Our waiting room, meanwhile, is often likened to a living room. Evergreen’s high-quality customer service and friendly staff only add to this comfort. We also go the extra mile when organising our patients’ travel arrangements. Unlike other clinics, we offer a flight and hotel booking service through our website, helping clients to plan their entire journey, rather than simply picking them up from the airport. It is this attention to detail, along with our reputation for complex restorations and aesthetic treatments, that ensures our patients always leave Budapest with a Hollywood smile.